Egg Pepper Masala is a delicious and easy to make dish. Best served with rice dishes. 1. Boil the eggs and remove the shells. Keep aside. 2. Heat 1 tsp oil in a pan. 3. Stir-fry the peppercorns, cumin seeds, saunf, cinnamon, ginger, garlic, onions, tomato and coconut for 2 minutes. 4. Remove and grind them together to a smooth paste. 5. Heat the remaining oil in the pan. 6. Fry the mustard seeds and curry leaves for 30 seconds. 7. Add the ground paste, turmeric powder and salt. 8. Mix well and cook till the oil starts to separate. 9. Lightly prick the eggs with a fork and add to the pan. 10. Gently stir without breaking the eggs. 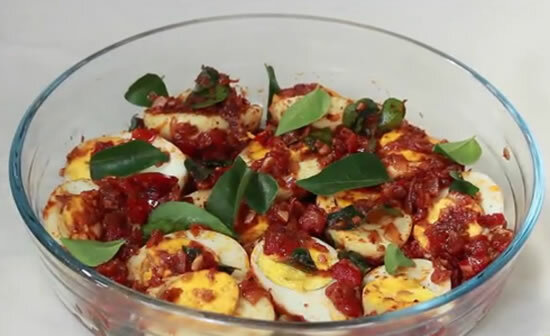 Feel free to comment or share your thoughts on this Egg Pepper Masala Recipe from Awesome Cuisine.